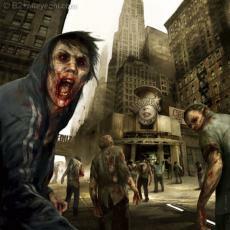 how would you fare in a zombie epidemic? fine out! The zombies are rising! What was once a small string of bizarre killing has exploded into an epidemic. People bitten by zombies are dying then suddenly reanimating to hunt and feast on the living! The government and military have declared your area a quarantine zone and pulled out, leaving you and those you know on your own. Can you survive the zombie apocalypse? The zombies: the zombies you are assumed to be dealing with are the usual slumping, stupid, slow moving but relentless and immune to any attack except one that destroys the brain. They are no stronger than an average human, but they do not tire. They are attracted by noise and hunt by sight and sound, they let out the trademark moan when prey is in sight. The virus is transmitted by body fluids entering the body, usually from bites but also from ingested blood or open wounds. There may be a cure, but you do not know, all you need to know is that you need to survive. The outbreak has just hit the breaking point, there is panic in the street as people are eaten alive. Before you do anything you need to hide out somewhere until thing are calm enough for you to move, you gather your supplies weapons and any loved ones you may have and head out. Where do you go to hide? E) The shopping mall, its looting time baby! C) baggy clothes, and im not cutting my hair! you cant fight zombies with fists! What kind of weapon would you prefer for zombie killing up close? killing zombies is not always best done up close, besides a pistol sidearm, witch weapon would you choose to fight off the hordes of the unread? You cant travel very well without a destination. The last scraps of radio broadcast you get is from the military telling everyone to get to a large city nearby so they can be better defended. Where do you go? You need food, medicine and supplies, your out of canned goods and hunting is not a favorable option right now. Where do you look for supplies? While scavenging for supplies you have managed to remain undetected by the zombies wandering around, but you come across a lone zombie staggering around right in the path you need to take, how do you deal with it? A) Shoot it in the head with your rifle, boom head shot! D) sneak up behind it and bash it's skull in. You best friend has just been bitten! Hes only got an hour or so before he turns like the others, what do you do? F) Cut off the bitten limb in hopes of stopping the infection. While traveling, you (and your group if any) come across a small band of survivors, how do you react? C) sneak up on them, aim your gun at them and tell them to drop their weapons and no one will get hurt. Then if all goes well apologize for the precaution and join up with them. D) Kill them in a sneak attack and take all their stuff! A swarm of zombies is hot on your tail and you cant fight them all, you need to lose them fast! How do you do this? C) push your buddy in front of them to take their minds off of you and concentrate on their new snack. D) Stand and give those undead bastards a taste of the grape! A) I am in my prime and I exersize every day! © Copyright 2019 alex wolff. All rights reserved. Before I anwser any of these questions, you may want to add an item to question 3, you forgot the gun/shotgun dude, an essential tool when fighting the Undead, lol. oh nevermind i see you have guns covered in question 4, my bad, lol. know how to survive and get supplies and to keep going pretty well, but when it comes to fighting zombies, your going to need to rely on others or end up zombie chow. You head into thigs to fast, your long hair and clothes provide pleny of things for zombies to grab and you tend to go towards places that have lots of people, and lots of zombies. your ax and machete work well up close, but the flame thrower wilbe more detremantal to you than helpful, burning zombies are very bad indeed. silli pyro. when outside large popualtion areas you do well however, keeping careful and cautious of others and your drive to live is decent. unfortuneatly you are too gung ho and put yourself in danger often. Right here goes nothing my anwsers to your quiz. Q 2- C. Baggy clothes, not cutting my hair. Q 6- D. Outside the affected Zone, nowhere in particular. Q 7- B. Travel with one or two friends I trust. Q 8- C. Small local store. Q 9 -D. Sneak up and bash its head in. Q 10 -B. *sniff* goodbye old buddy. Q13- A. Move on to another place. Q15 - 33 years old. Q16 - B. I am in okay shape, but no athlete, I can run for a bit and I am fairly strong. Aside from a few shortcomings in the saftey department you are a pretty efficiant zombie survivalist. your shotgun will be able to blow off zombie heads at close range, but will be lacking at longer rabges, your chain saw, though effifiant and powerful, has a limited fuel capacity and will likely draw more zombies nearby, but will be useful in defedgin your group against a large attack. thr SUV wll be useless on major roadways, witch will likely be choked with abandoned cars. stay to the side roads and the mobility and carrying capacity of the SUV will be useful. your clothes and long hair will provide the zombies with something to grab, so watch your back. the shopping mall will be crowded with looters and zombies, so if you must hide out there, find a single store, prefeibly a food store and hold up there, dont even try to fortify the entire place. even this way it is a dangerous hideout. in the end you are no action hero, but you'll be able to give the zombies some hell if they come for you. juts keep your eyes open, your head cool, your friends close and your gun loaded and you should be alright. Hmm.. A B, fine, lol, A B, i never... hmmph. As soon as I got your message I had to try this! Haha I've been wanting to do one of these for ages. Here's my answers. 9. D) sneak up behind it and bash it's skull in. 11. D) Kill them in a sneak attack and take all their stuff! 12. c) push your buddy in front of them to take their minds off of you and concentrate on their new snack. 16. A) I am in my prime and I exercise every day! Grade: A- you are an efficiant zombie killer, your chioce for the shotgun is a mixed one, it is effecteive up close but not ver accurate and has very little range. the car required fuel and will be useless on the major roadways. your are very pragmatic, and a downright stone cold mother@#$%er.dont expect to stay with others for long, so youll need to rely on your self, but your good choices make up for it nicely. a sedan has alnost zero off road capability, and speed is not really a big concern with the slow moving zombies, the sedan would be confined to the roads, and then to the ones that are not filled with abandoned cars from people trying to flee the city, or worse, more zombies. if you are in an area with few major roads this can work, but the fuel limitation will be severe, and gas stations will likely be one of the first places cleaned out. a hourse can serve as a menuravable mount that only need grass and sleep as fuel, though it takes considerable skill to ride them well, and to control them, they have a nice side feature. they can warn you of nearby zombies, instinctively reacting to their smell, but be careful if you dont have the skill to control your mount, it can tip the zombies off as well. and i own some hourses, they dont tire esily if they are kept healthy and fed. and on foot youa are slow, and you can esly out jog the undead in an open area. personally, id go for the pedal bike myself. 3) both F and D; it might be heavy, but chainsaws are good for hordes (so long as you close your mouth) and the hammer is a quick way of getting rid of one from behind without making noise. 4) Can I really only pick one? I would like all of them... a rifle for long range and an assuault rifle for mid range, and a flamethrower for hordes, or a shotgun for close quarters (house or something like that). The solution is everyone carries an assault rifle and then something more specific (one carries flamethrower, two with a shotgun, two with rifles, etc). That is my choice. Accept that I am breaking your multiple choice system. 5) B if I'm alone, A when I find people to join. Never join with enough for the SUV though. 7) B, but C if neccesary, and if neccesary, not for long. Only when no zombies are in sight or hundreds of them are in sight and another party needs help. hmm.. I'll give this a try. I doubt i'll do well tho lol. your choice to barricade your suburban home is not ideal and there are lots of people and zombies around, but you can fall back and barricade/destroy the stairs should things go south. your zombie epidemic dress sense is good, the short hair and tight clothes will reduce things for zombies to grab. the ax/machete is a great choice, not onyl can they be used to decapitate zombies, but they have other uses as well. (just be sure to deal with the aputated head, even seperated from the body they can still bite, a pistol is recommended for this, or just chop the head in half). the semi automatic rifle is an exellent choice, you can dispatch zombies from a meduim to short range with ease, but long range may require more practice, since a round is fired every time you pull the trigger, you will need a bit of discipline to prevent wasting ammo. and thanks for not choosing the flame thrower. the motorbike is small and can swerve between zombies if you stay calm, they have good off road capabilities and are really fast, just remember that they need fuel to run, so be sure to stock up beforehand to prevent running dry in the middle of a zombie horde. a good escape plan, just get to safety and worry about places later. you dont do so well with the large group of people, it may seem safer, but you will need to keep track of them, they will slow you down and will greatly increase the chances of detection by zombies. the grocery store is a risky venture, but play it safe and it will probably pay off, if not, then your boned. the choice to shoot the zombie is safer, but carries a good chance of detection by other zombies hearing the gunshot, only do this if you are sure there are no other zombies around. you mad ea poor choice in trying to save your friend, they will only serve as a threat to you, and even if they are kept away from you, they will force you to stay in one place, and they have a good chance of attracting other zombies to your position. you did well in playing it safe with the other surviors, you never know if they are good citzens or violent renegades. goo work using the wall, zombies cant climb nor do they posses the intelligent to go around wall that do not have an immidiate opening near them. you did well in moving on, with zombies spreading this fast, it is wise to keep moving. all in all you did well, despite a few shortcomeings you came out on top-ish. with a bit of work you will likely be able to survive the coming zombie uprising. None, i'd run them off. I couldn't kill any of my friends. A, and run like hell. Somewhere between A and B.
the rural home is a good place, not in a tightly populated area and well defended given time to prepare. the baggy clothes are a tenuous choice, but your short hair will provide some protection from a grabbing zombie hand. the axe or mathese are great choices, and can be used for more than just killing zombies. the semi-automatic rifle is an ideal choice, it gives good range and accuracy even at short range with less of a chance to waste ammo. the sedan is a noisy, cumbersome and gas using choice, stick to small roads and avoid zombie infested area or risk drawing attention. while not with a destination in mind, you can escape with more flexibility in your decesions. the moderate sized group is useful, but has a higher risk of drawing zombies and demands more supplies. the local store will have less of a chance of being overrun and will yeild a moderate catch of goods. the headshot is noisy and may attract other zombies. just be sure to get FAr away from your infected friend. you wave to the other survivors, a risky ventue as you cant be sure of thier motives. the molotove will onyl serve to make your zombie persuers to become flaming ones, not very fun. you deal with your final destination failure well. you are in great shape. 7- With 2 of my pals. 9- Sneak up and bash its skull in. 10- "Sniff" goodbye old buddy. 12- Scramble over the wall. 13- Move on and try to get as far as possible. 16- I'm in OK shape. your choice of a hiding location is relivily poor, it is hard to defend and is likey to be full of rioters, however it is your only poor choice. the hammer is durable and good for bashing skulls and can be used as a tool as well, and the rifle is the ideal anti zombie weapon. going on foot is quiet but slow, then agian speed is not really needed with zombies. you do wella t avoiding the infected ang getting supplies while dealing with infected friends, you are a great zombie survivor with few faults. 3.An ax! Chainsaw would be good, but the gas would run out. 7.One or two friends I trust. 12. Give them a taste of the grape! 16. In okay shape, but not an athelete. Things That Piss Me Off!! Printer ink salesman gets owned. "Education Is Important In One's Life"
This page was created in 0.4029 seconds.